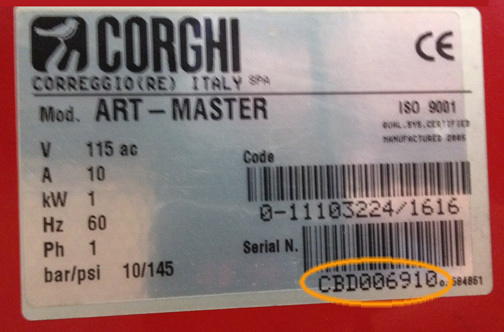 Before looking for a part, you need the Model and Serial number of your machine! This information is located on a silver decal, usually near where the air hose attaches to the filter, regulator, oil reservoir. Check the serial number cheat sheet for complete info here. are the easiest to decipher. C means Corghi, the second letter is the year & month, A = 2004, B = 2005, C = 2006 etc. The older machines have 3 or 4 letters indicating the year and month.